COLUMBUS, Ohio – Today, the Animal Legal Defense Fund, the nation’s preeminent legal advocacy organization for animals, announced the filing of a nationwide consumer class action lawsuit against Petland, a national pet store chain, and the chain’s Kennesaw, Georgia location. The Animal Legal Defense Fund filed in United States District Court for the Northern District of Georgia alleging Petland violated the federal Racketeer Influenced and Corrupt Organization (RICO) Act and Georgia RICO Act. The lawsuit is filed on behalf of a putative nationwide class of consumers victimized by Petland’s predatory business practices of charging premium prices for puppies Petland has “guaranteed” to be healthy—as certified by Petland’s veterinarians—when Petland knows full well it is selling puppies prone to illnesses and other defects, including “puppy-mill” sourced puppies. A puppy mill is a large-scale commercial dog-breeding facility. Puppy mills produce the largest number of puppies as quickly as possible, without consideration of the care of the animals. Breeding practices and the crowded, unsanitary conditions in which puppies born in mills live during the first weeks of their lives put the dogs at risk of numerous genetic and hereditary conditions and deadly diseases. Additionally, many puppy mill dogs experience behavioral and psychological problems throughout their lives from lack of early socialization and being weaned too young. The lawsuit also contends that Petland further inflates the animals’ price with phony services that exist only to line the company’s pockets, not benefit consumers or their dogs. The lawsuit alleges that the plaintiff and the nationwide class were bilked into paying premium prices for puppies but did not receive the benefit of the bargain. Petland’s fraud harmed all class members, regardless of whether they were sold a sick or healthy pet, because they were paying for a “certified” healthy puppy. The complaint alleges the certification was a sham—it would be by pure chance if a customer got a healthy puppy, which is not what consumers thought they were paying for—at a premium price. Petland has profited handsomely from its fraudulent scheme. The lawsuit comes at a critical time for the puppy mill and pet store industry and its many victims. In Georgia this spring, consumers and animal advocates narrowly defeated a bill in the state legislature dubbed the “Petland bill,” a sweetheart deal which would have capped damages for consumers harmed by Georgia pet stores and precluded cities and counties in the state from adopting stricter standards or banning the retail sale of pets altogether, as scores of cities and counties around the country have done over the last few years. Similar pet store centric bills masquerading as consumer protection legislation are popping up nationwide, the industry’s desperate attempt to stem the growing tide of opposition to its puppy-mill-dependent supply chain. The Animal Legal Defense Fund is litigating the case in collaboration with Georgia attorney Tamara Feliciano and attorneys from Andersen Sleater Sianni LLC. The Animal Legal Defense Fund has filed a federal consumer class action lawsuit against the national pet store chain, Petland, on behalf of consumers who allege they were harmed by Petland’s fraudulent scheme to charge top-shelf prices for puppy mill-sourced puppies and phony services. The lawsuit alleges that buyers were swindled into purchasing puppies purportedly “certified” as healthy by a veterinarian and paying even more for worthless services from Petland-directed veterinarians and a Petland front group posing as a consumer claims manager. In puppy mills, both mother dogs and puppies suffer serious neglect and cruelty. As more and more consumers purposefully avoid purchasing puppies produced from mills, it is crucial that pet stores be transparent about the origin of their dogs and be held responsible for selling sick puppies to unknowing consumers. 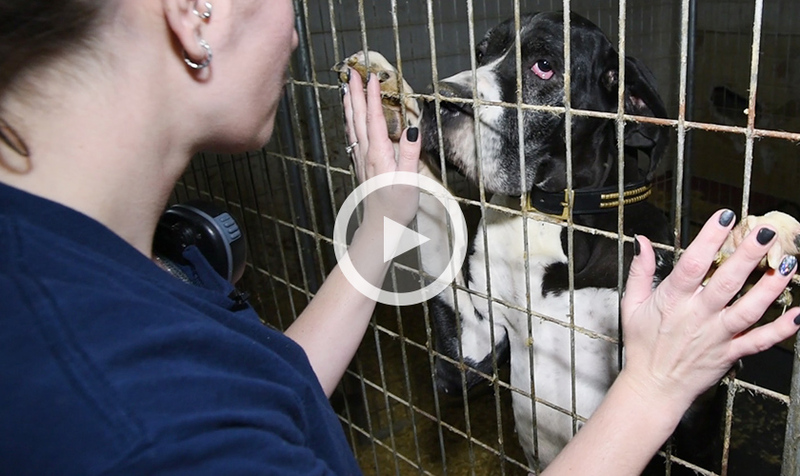 I was on the ground with the Animal Rescue Team and what we found was unimaginable: 84 Great Danes had been living in and around a 15,000-square-foot home in New Hampshire, walls smeared with feces and wooden floors thick with their waste. Watch this rescue footage -- and then please help save more animals by making a gift to the Animal Rescue Team today. ...I witnessed remarkable teamwork as four of our Animal Rescue Team members tag-teamed to remove seven huge dogs from cages in a room filled with ammonia fumes and no ventilation. After dealing with one dog, the handler would get some fresh air while another rescuer went in to get the next dog. ...I watched the leader of our Animal Rescue Team, Sára Varsa, think fast when faced with a huge dilemma. Some of the dogs were literally too large for the largest cages we had. Even though we had three huge trucks, Sára knew we needed more. She made a quick call and before you know it -- horse trucks were delivered to the scene. Over and over she was met with variables and, with her team, found a solution. From 5 a.m. to 11 p.m., our Animal Rescue Team worked tirelessly to save all of the dogs from this horrible situation. And by midnight, every dog was in a warm pile of shavings, fed and asleep in a safe place. It’s only with the support of generous animal lovers like you that this lifesaving work is possible. Please make an emergency donation to save more animals who are suffering from cruelty. All of the dogs have now received full veterinary exams, but they will continue to need ongoing care to address a range of medical conditions and to receive enrichment and training. It’s heartwarming to see that these sweet dogs are already getting much more comfortable being around people -- regaining trust, despite everything they have gone through. you can help give more animals like them a second chance at life. SAN FRANSICO – Today, the Animal Legal Defense Fund filed suit against the United States Department of Agriculture (USDA) for removing tens of thousands of animal welfare records from the agency’s website. According to the lawsuit, the USDA’s decision to remove the records violates both the Freedom of Information Act (FOIA) and the Administrative Procedure Act (APA). The removed documents revealed inhumane treatment of animals at thousands of research laboratories, roadside zoos and puppy mills across the country. The lawsuit, filed in the Northern District of California on behalf of a coalition of animal protection organizations, contends that the USDA violated FOIA, which requires federal agencies to affirmatively disclose final orders and frequently requested records. It also argues that the USDA violated the APA, which prohibits agencies from taking actions that are “arbitrary, capricious, an abuse of discretion, or otherwise not in accordance with law[. ]” If the coalition is successful with its claim under the APA, the USDA would be required to resume posting the records online so they are available to the public. The Animal Legal Defense Fund is joined in the lawsuit by Stop Animal Exploitation NOW!, Companion Animal Protection Society and Animal Folks. The USDA’s decision to stop posting records significantly burdens the organizations because they must now manage voluminous FOIA requests to access the same records, potentially pay large fees, and wait for several months or even years to obtain records previously accessible immediately online at no cost. Public access to these records is especially important in light of the USDA’s chronically lackadaisical enforcement of the federal Animal Welfare Act (AWA). The Office of Inspector General, an oversight division of the USDA, regularly finds that the USDA renders its enforcement of the AWA largely ineffective by not aggressively pursuing enforcement actions against substandard facilities and by significantly discounting penalties even when it does pursue enforcement action. The plaintiffs filing today’s lawsuit regularly utilized the USDA database and enforcement actions page to obtain records about the conditions of animals at facilities regulated under the AWA, such as research laboratories, puppy mills and zoos around the country. In turn, these organizations use the records to advocate for stronger animal protection policies, confront the USDA over inadequate regulation of substandard facilities, supply evidence for law enforcement action and build legal cases against especially egregious violators. The Animal Legal Defense Fund relied on these records in its groundbreaking Endangered Species Act (ESA) victory against the Cricket Hollow Animal Park (previously Cricket Hollow Zoo), a roadside zoo that cruelly confined endangered animals in inhumane conditions. It was the first victory applying the ESA to protect animals in captivity. The organizations are represented pro bono by Margaret Kwoka, Associate Professor at University of Denver Sturm College of Law, and Perkins Coie LLP. For more information visit, aldf.org. Founded in 1992, the Companion Animal Protection Society (CAPS) is the only national nonprofit dedicated exclusively to protecting companion animals from cruelty in pet shops and puppy/kitten mills. CAPS addresses animal suffering through investigations, legislation, education, media relations, consumer assistance, and rescue. About Stop Animal Exploitation NOW! SAEN (Stop Animal Exploitation NOW!) is a national non-profit animal advocacy organization dedicated to the rights of all animals. Our mission is to end the exploitation of animals imprisoned in laboratories by educating the public with the reality of what is happening inside the vivisection industry and engaging government agencies to enforce laws, issue citations, and levy fines against criminal labs. Through in-depth investigations of laboratories and national media campaigns, SAEN exposes and ends the misery of animals. Animal Folks is a nonprofit organization devoted to protecting the lives of animals by modernizing the animal law enforcement system in Minnesota. Animal Folks is focused on systemic change — finding new, innovative ways to prevent animal cruelty and improve how animal law is enforced throughout Minnesota. To achieve this mission, Animal Folks conducts research on animal cruelty issues and cases, creates training materials and resources, files criminal and civil complaints against abusers, and collaborates with state, local and national authorities and organizations for sustainable reforms. www.animalfolks.org. "The PLC is encouraged by and strongly supports the work being conducted by Dr. Candace Croney and The Purdue University School of Veterinary Medicine to establish science based standards for breeders that will raise the care and welfare of their animals.” said Doug Poindexter President of the World Pet Association and PLC Trustee. More information on the Purdue Study and several white papers already published can be found here - http://vet.purdue.edu/CAWS/engagement.php#projects. Elmwood, Wis.—The ASPCA® (American Society for the Prevention of Cruelty to Animals®) and Animal Humane Society (AHS) are assisting the Pierce County Sheriff’s Office with the seizure of 48 dogs from a substandard, unlicensed breeding facility in Elmwood, Wis. The dogs were seized from the property Friday morning after warrants were served, and the owner of the facility was booked into the Pierce County Jail for mistreatment of animals, not providing proper food to confined animals and improper animal sheltering. The 35 adults and 13 puppies, all yellow Labradors, were discovered living indoors in small, filthy travel crates, with no access to food or water. Numerous deceased animals were also found on the property. The ASPCA believes the facility to be a puppy mill--a large-scale breeding operation designed to generate profits at the cost of the animals’ health and well-being. The dogs have been transported to AHS (Golden Valley, Minn.), where they are receiving urgent medical treatment from ASPCA and AHS veterinarians. At this time, the dogs are considered evidence and will be cared for by AHS responders until their custody is determined by the court. The ASPCA is also collecting forensic evidence and providing legal support to strengthen the case and ensure the best legal outcome for these dogs. "We’re proud to be known as the go-to resource for investigations in this region," said Janelle Dixon, President & CEO of Animal Humane Society. "Our humane agents investigate hundreds of reports of animal cruelty and neglect each year. As a result, we have the experience and ability to care for large numbers of animals, and the medical and behavioral expertise to provide the specialized care these vulnerable animals need." The ASPCA Field Investigations and Response team has rescued thousands of dogs from puppy mills across the nation. Furthermore, the ASPCA’s Government Relations department has been active in promoting legislation at both the state and federal levels to strengthen regulations and raise minimum standards of care for dogs in puppy mills. For more information about puppy mills and how to fight animal cruelty, join the ASPCA Advocacy Brigade at www.aspca.org. Superheroes come in all shapes and sizes, and some ride motorcycles! 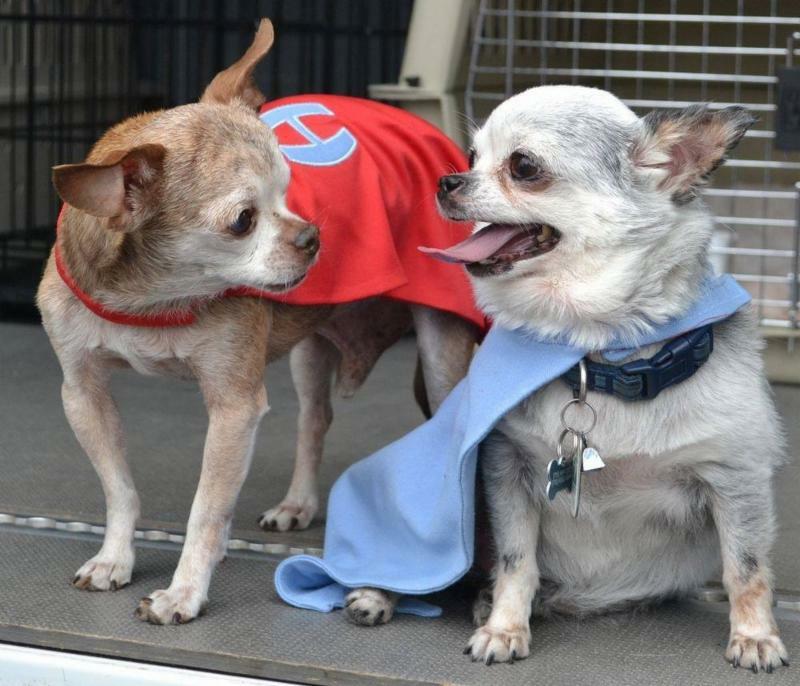 Two tiny puppy mill survivors, Harley and Teddy, will once again don their superhero capes and travel through the Midwest this weekend saving dogs from puppy mills.